“He floated 18 inches off the floor back to his room,” Benny Barrett said, smiling at the memory of a cancer patient who played with one of his musical heroes. The experience happened during one of the weekly concerts at the Baylor Charles A. Sammons Cancer Center in Dallas. Jazz harpist Carlos Guedes was the volunteer musician playing that day when the bone marrow transplant patient walked by and saw him. Learning that he was a fan, Carlos asked him to play with him. The patient’s wife went to his room, grabbed his bass, and then his pump went off just as he started to play. 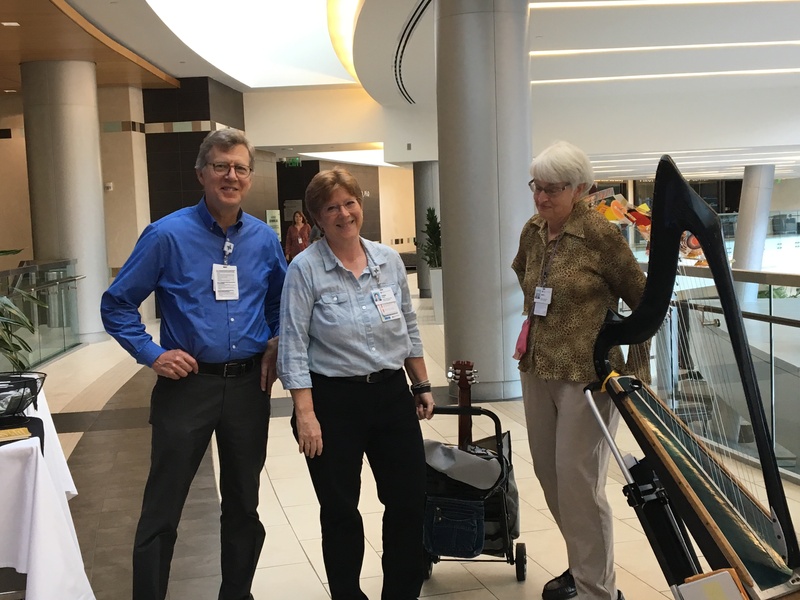 The bedside music program is one way the Virginia R. Cvetko cancer education and support center has brought the arts into the healing process at Baylor University Medical Center at Dallas, tapping into the powerful effect of music on patient health and well-being. The music helps in many ways, patients tell us it helps manage pain, can lower blood pressure, anxiety and nausea. There are also music practitioners under the arts in medicine program. Baylor University Medical Center is the only health care provider in North Texas that employs professional musicians who visit sick patients in their rooms. Patients can choose from a variety of musical instruments, like a guitar, a piano, even a harp, then relax as live music fills the room. Photographed are three music practitioners at Baylor Charles A. Sammons Cancer Center on the campus of Baylor University Medical Center at Dallas. You can’t walk away from the impact. When you bring art into the healing equation, you just have to stand back and watch miracles happen. “The music helps in many ways, patients tell us it helps manage pain, can lower blood pressure, anxiety and nausea,” Benny said. The newest service to the program is art therapy, which includes a stand-alone art room and a mobile art cart. Patients are challenged and encouraged to express themselves creatively through drawing or painting. Their images, often about their cancer journey, are then put on display at exhibits and throughout the cancer center. The Baylor Scott & White Health music therapy program is 100 percent funded by philanthropy. Visit our website to learn more about how you can give. Next Next post: Popular heartburn medications associated with stroke: Should you be concerned?